We're working on the roadmap features, announced two weeks ago. Since most of them are major under-the-hood changes and improvements we started working on the underlying mechanics, rather than the visual representations of these new features. 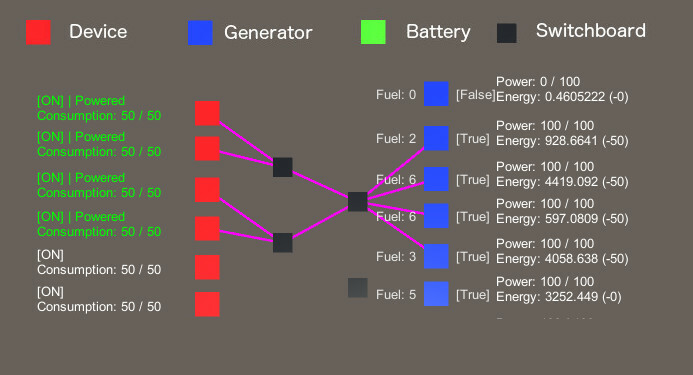 For that reason, today's blog post is going to be a bit more technical - it concerns the reworked energy and energy distribution system. The most important change is that generators finally no longer consume fuel at a flat-rate. 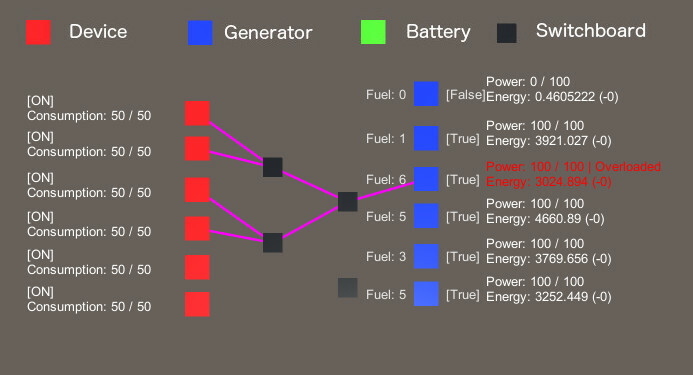 The fuel consumption is now fully based on the energy consumption of the devices connected to the generator. In other words, generators and batteries powering wheels will no longer drain fuel while the wheels are standing still. Furthermore batteries will act like proper accumulators. 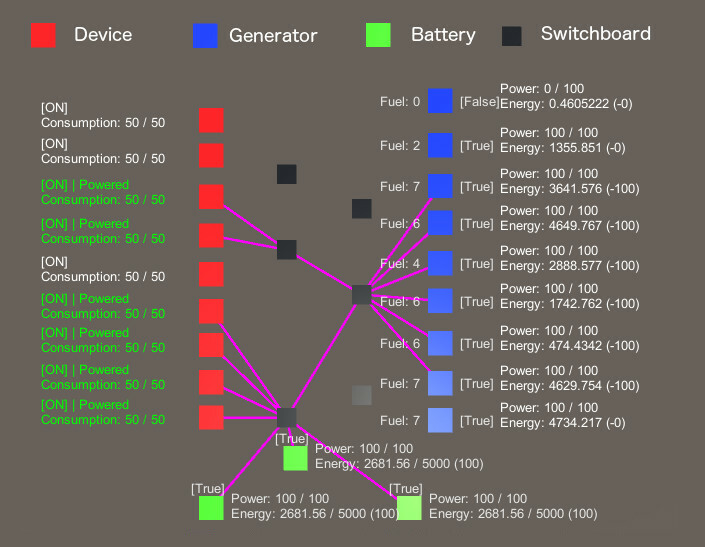 When part of an energy network in which there's more consumption than the total power generated, batteries act like generators. When there are generators (or solar panels) with enough power output, batteries accumulate and store energy from the network. Another change is that batteries will no longer be refueled by the small batteries from player's inventory. To let you create whole systems and power networks, with back-up circuits, emergency generators and so on, we will be adding switchboards - a power boards that combine all devices into a single nod in the network, that can be connected and powered on/off with a single switch. 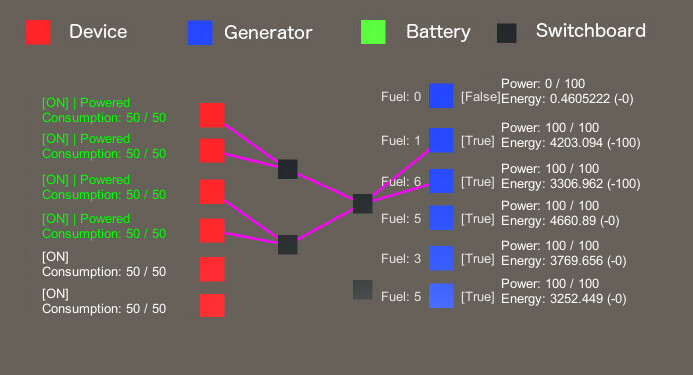 Pavel has also fixed the bug that was present in the old system, where a single device connected to multiple generators caused unfounded power losses in the circuit. Circuits in this new system work exactly as they should. 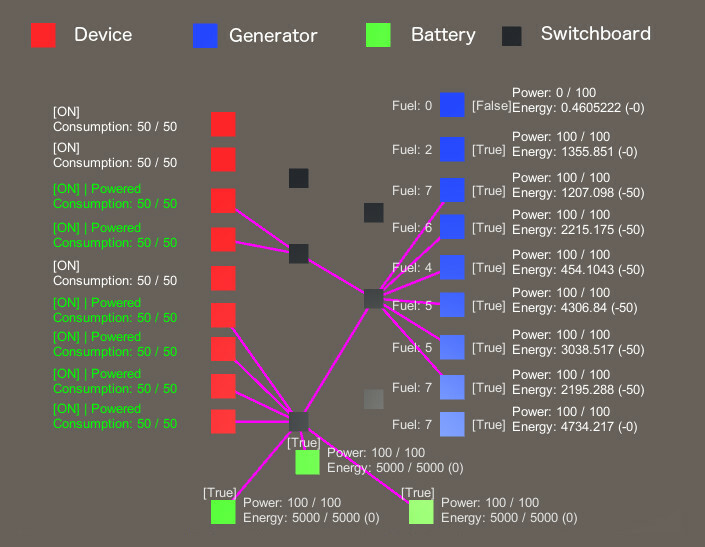 Let's go through some of the scenarios in Pavel's energy system prototype. When the load is too high, the whole system shuts down. You can add one more to get it back online. Or connect four generators total to evenly distribute the load. Imagine you arrive in your base with your battery powered rover and the batteries need recharging. You just connect two switches, or a generator to the rover main switch and that's it. The batteries start recharging. Once finished, batteries will switch to a stand-by mode and longer drain or provide energy to the circuit. Solar panels will be acting as generators too, with dynamic energy production depending on the weather conditions. If no major problems arise, they should make it to the big November update. The idea is to make the use batteries easier and utilize them on smaller vehicles paired with solar panels. Generators should only be used on much bigger vehicles, because they will be very heavy - imagine mobile bases, big cargo trucks and planetary crawlers. As you can see it comes paired with hi-power suspensions that can carry a lot more weight and the wheel will have a lot more power than its smaller counterparts. 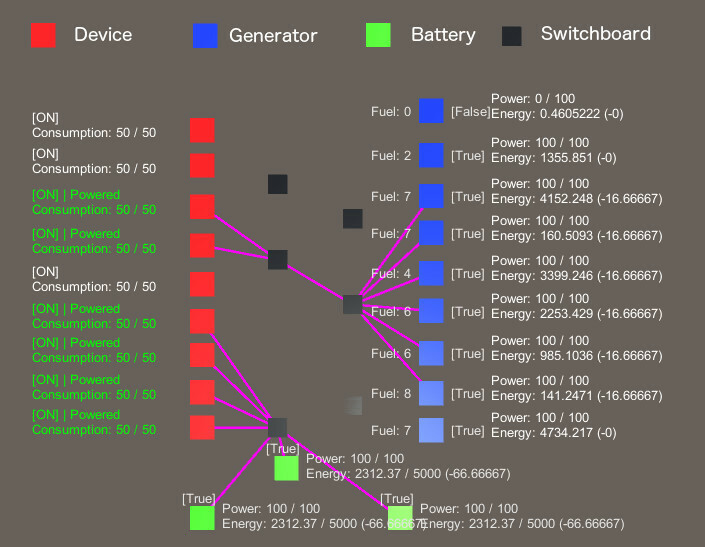 We did some preliminary settings, but exactly how much more (less) power is needed will depend on your feedback. What else is there to cover? The central grid control. Coming up next. For now, enjoy the 7.4 update and the new construction options.